Beef short rib is braised until deliciously tender, then mingled with tomato, wine and herbs to create this incredible sauce. Try this recipe for Red Wine Ragu. There’s something supremely satisfying about combining random ingredients in a large pot on your stove, and coming back and hour or two later to find they have morphed and mingled into something glorious. Such is the case with Red Wine Ragu. Ragu, essentially a meat sauce, is an easy stovetop braise that can be used for a variety of end purposes. You can eat it alone as a stew with some crusty bread, toss with pasta, use as a lasagna layer, spoon over soft grits… I’m sure there’s many more, I’m just making myself too hungry! You may want to double the batch for this recipe so you can freeze half and use it for one of these moreish alternate purposes. In this case, the rich tomato base of the ragu is lent a bonus depth of flavor by the addition of a hearty red wine. I prefer to use Shiraz or Cab Sav, something with serious guts. This is no time to pretend that Pinot Noir is gonna stand up to the beefy flavors. As for the meat – boneless beef short rib proves the perfect protein partner. Sorry about all those p’s, but it’s true. 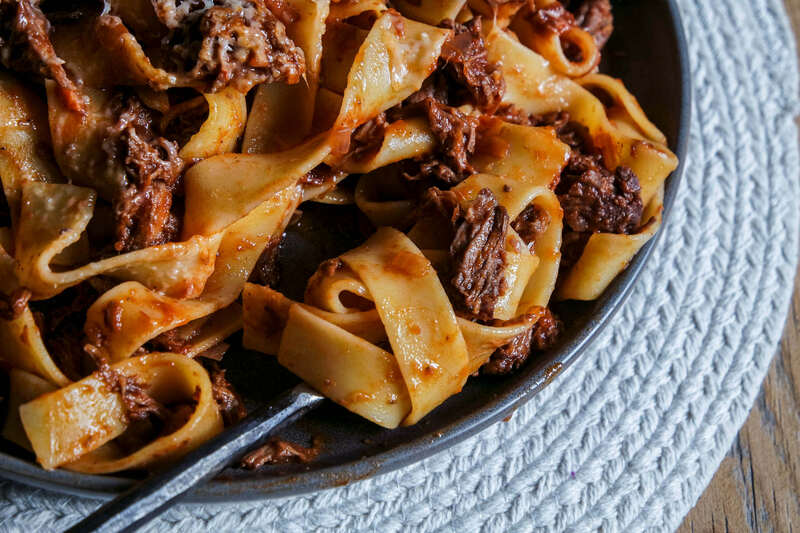 Once tender, short rib shreds easily into delicate beefy strands that stick to the pappardelle pasta better than clumps of ground beef. If you can’t find boneless beef short ribs, you can use the bone in kind (they may take a little longer to soften) or substitute with 2 inch strips of chuck roast. The short rib pieces should already be in strips, but if using chuck roast cut into 1-2” strips. Place a heavy based pot (I used enameled cast iron) over medium high heat. Add 1 tablespoon of the oil. Place half the beef into the pot to brown. We recommend doing this in two batches to avoid overcrowding. Brown for at least 7-10 minutes per side, then remove from pot. Add another tablespoon of oil and repeat with second batch, then remove from pot. Add remaining oil to pot, turn heat to medium. Add onions, garlic and carrots. Cook until softened, about 5 minutes. Add half the wine to the vegetable mix, and use a spoon to dislodge all the crusty brown bits from the bottom of the pot. Add the remaining wine, crushed tomatoes, tomato paste, oregano, salt, pepper, stock and bay leaves to the pot. Stir then add the browned meat. Turn heat to medium low so that there is a gentle simmer/bubble. Place lid over pot and cook for two hours, stirring occasionally. Use tongs to remove beef pieces from liquid, and shred finely using two forks. Return shredded beef to the pot and stir into the sauce. Taste, and add additional salt if desired. Replace lid and cook for a further 15 minutes over low heat to allow the meat to mingle with the sauce. Boil the pasta according to packet directions (I recommend leaving it al dente), then drain. You can either add it straight into the pot and toss with ragu, or add ragu to pasta one ladle at a time to sauce to your preference. Top with grated parmesan and fresh basil, then serve.